Walk into any running store and you’re bound to get lost in a sea of neon-colored, fancy-treaded, gel-patterned athletic sneakers. Got flat feet? There’s a shoe for that. Do you overpronate — i.e., does your foot tend to roll toward the inside with each step? There’s a shoe for that, too. Want to channel your inner ultra-athlete? Go barefoot with a glove-like minimalist fit. If you had a chance to pick up this week’s edition of Marine Corps Times, you read about Staff Sgt. Jeremy Boutwell and how we’re running the Marine Corps Marathon together on Oct. 28. Boutwell medically retired from the Corps in July and was wounded during a 2004 IED attack in Iraq. The Texasnative is blind in one eye and suffers from chronic back and muscle pain from leg injuries. Despite all of this, Boutwell has committed to pounding pavement for 26.2 miles. We had a chance to check in early this week over Skype and discussed how training is going with about two months left before the race. Quizzing each other on camel backs, favorite flavors of GU running gel and the “best” carbo-loading fuel the night before a big race, we of course talked about what kind of shoes we run in. 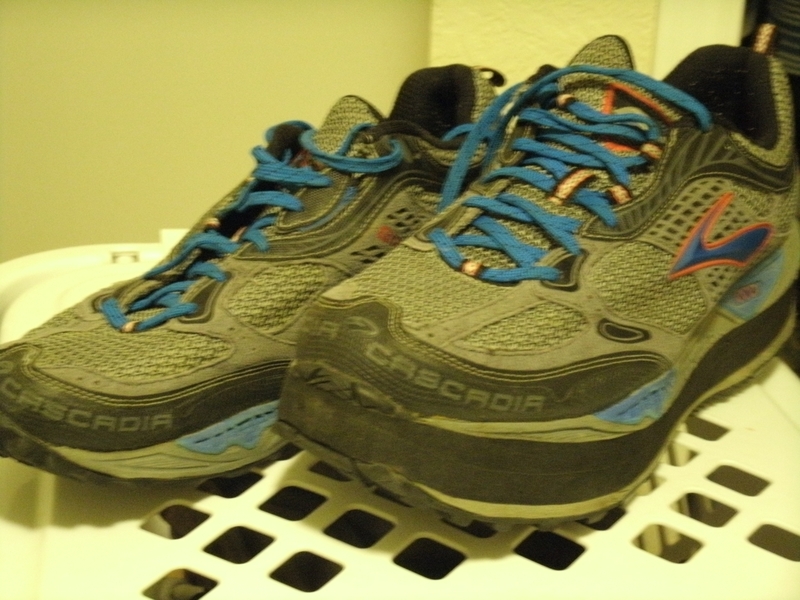 Alternatively, Boutwell described himself as a “simple man” and showed off his black and grey trail shoe. His left sneaker is noticeably taller and has a thicker sole on the bottom. Boutwell told me how he gets his left sneaker tailored with 1 inch of additional foam in order to compensate for his height discrepancy. Doctors were forced to fuse his femur back together because of severe shrapnel wounds, which resulted in a shorter left leg. “If I didn’t [get them tailored], it would feel like [I was] taking a step off of a curb every step I take,” he said. Boutwell said the process of buying new running sneakers isn’t as easy as it is for most runners. In addition to being time consuming — it takes several weeks from the time he orders a pair to when a cobbler can complete the fix — it’s costly too. Boutwell orders the same brand of trail shoe two times a year on-line and goes through his primary care and orthopedic doctors to get a prescription to have the shoe modified. He pays $60 out of pocket each time. Though Tricare or VA Hospital would likely cover the cost, Boutwell said the time it takes isn’t worth it. He’d rather eat the cost himself than go through his insurance company and delay the process any more. Boutwell gets all of his left shoes, not just his trail sneakers, modified. He’s tried to find a different running sneaker but said he always returns to what he’s used to because the sole is basic and flat and allows a cobbler to make the fix without any trouble. Boutwell said finding a good cobbler can be tricky. He’s had shoe repair shops tell him that they need a license to make the fix or that they don’t feel comfortable building up his sneaker. He found a cobbler nearCamp Lejeune,N.C., that did “great work,” [but]has yet to try out the new shop nearSan Antoniowhere he’s living. Despite limited shoe options, Boutwell’s shoe shopping mentality is like every other runner. “I want any advantage that I can get if I’m running on the road, that’s what I’m looking for in a shoe,” he said.